Creates a new ofPath instance. Note that angleEnd needs to be larger than angleBegin, i.e. 0, 180 is ok, while 180,0 is not. Creates an arc at x,y,z, which has the radiusX, radiusY, and begins at angleBegin and ends at angleEnd. Create a cubic bezier line from the current drawing point with the two control points indicated by ofPoint cp1 and ofPoint cp2, that ends at ofPoint p.
Creates this: The control points are shown in yellow. Create a cubic bezier line from the current drawing point with the 2 control points indicated by glm::vec3 cp1 and cp2, that ends at glm::vec3 to. The control points are shown in red. 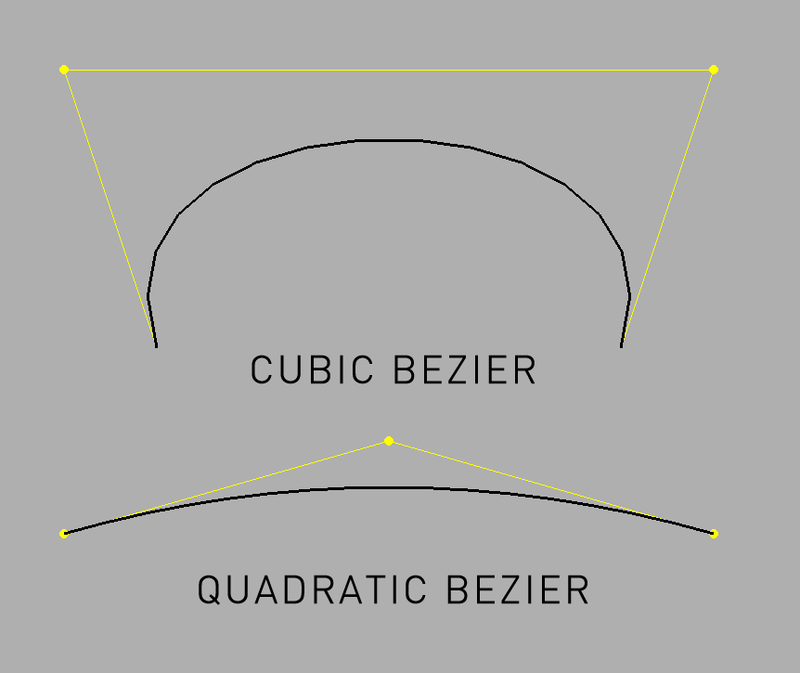 Create a cubic bezier line from the current drawing point with the two control points indicated by the coordinates (cx1, cy1) and (cx2, cy2), that ends at the coordinate (x, y). Create a cubic bezier line in 3D space from the current drawing point with the two control points indicated by the coordinates (cx1, cy1, cz1) and (cx2, cy2, cz2), that ends at the coordinate (x, y, z). Create a cubic bezier line in 3D space from the current drawing point with the 2 control points indicated by the coordinates cx1, cy1, cz1 and cx2, cy2, cz2, that ends at the coordinates x, y, z.
Removes all subpaths from the ofPath instance. Closes the current subpath and creates a new subpath, either an ofPolyline or ofSubPath by calling newSubPath(), ensuring that the closed path doesn't have new points added to it. 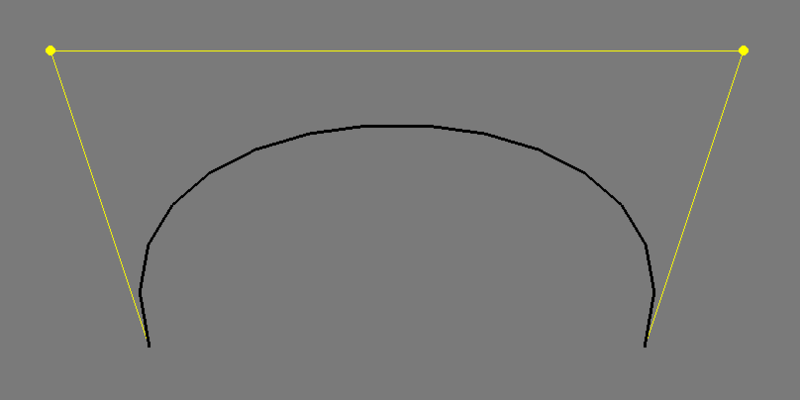 Draws a curve to p from the current drawing position. Draws a curve to x,y,z from the current drawing position. Draws the path at 0,0. Calling draw() also calls tessellate(). Draws the path at x,y. Calling draw() also calls tessellate(). Returns the ofColor that the ofPath is using. This returns an ofPolyline representing the outline of an ofPath. Returns the stroke color that the ofPath is using. Returns the poly winding mode currently in use. Whether the path is using a fill or not. Get whether the path is using a fill or not. Draws a straight line from the current drawing position to the location indicated by p.
Draws a straight line from the current drawing position to the location indicated by x,y. Draws a straight line from the current drawing position to the location indicated by x,y,z. Moves the drawing position to p. This means that a subsequent calls to, for instance, lineTo() or curveTo() will connect the location p to the new location. Moves the drawing position to x,y.z. This means that a subsequent calls to, for instance, lineTo() or curveTo() will connect the location x,y,z to the new location. Creates a new subpath, either an ofPolyline instance or an ofSubPath instance. All points added after a call to ofSubPath will be done in the newly created subpath. Calling close() automatically calls create newSubPath(), ensuring that the closed path doesn't have new points added to it. Create a quadratic bezier line in 3D space from the current drawing point with the control points indicated by ofPoint cp1 and ofPoint cp2, and that ends at ofPoint p.
Create a quadratic bezier line in 3D space from the current drawing point with the beginning indicated by the coordinates cx1, cy1, cz1, the control point at cx2, cy2, cz2, and that ends at the coordinates x, y, z. Creates a quadratic bezier line in 2D space from the current drawing point with the beginning indicated by the point p1, the control point at p2, and that ends at the point p3. Creates a quadratic bezier line in 3D space from the current drawing point with the control points indicated by the coordinates (cx1, cy1, cz1) and (cx2, cy2, cz2), and that ends at the coordinate (x, y, z). Changes the size of either the ofPolyline or ofSubPath instances that the ofPath contains. These changes are non-reversible, so for instance scaling by 0,0 zeroes out all data. This sets the color of the path. This affects both the line if the path is drawn as wireframe and the fill if the path is drawn with fill. All subpaths are affected. This sets the fill color of the path. This has no affect if the path is drawn as wireframe. Sets whether the path should be drawn as wireframes or filled. Set the way that the points in the sub paths are connected. OpenGL can only render convex polygons which means that any shape that isn't convex, i.e. that has points which are concave, going inwards, need to be tessellated into triangles so that OpenGL can render them. If you're using filled shapes with your ofPath this is done automatically for you. This sets the stroke color of the path. This has no affect if the path is drawn filled. Sets the stroke width of the line if the ofPath is to be drawn not in wireframe.